This is the oldest recording of an American voice and the first-ever recording of a musical performance. Recorded by a Thomas Edison-invented phonograph in 1878, the audio recording (which lasts 78 seconds) is pretty much "as far back as we can go" in terms of the history of recorded sound. The recording starts with a cornet solo and then transitions to a man reciting "Mary Had a Little Lamb" and "Old Mother Hubbard." How did we manage to re-capture a recording from over 100 years ago? It all starts with Edison. 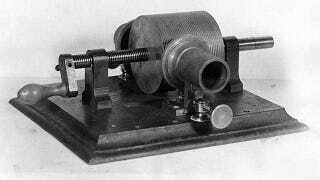 A hand crank turned the cylinder under a stylus that would move up and down over the foil, recording the sound waves created by the operator's voice. The stylus would eventually tear the foil after just a few playbacks, and the person demonstrating the technology would typically tear up the tinfoil and hand the pieces out as souvenirs, according to museum curator Chris Hunter.